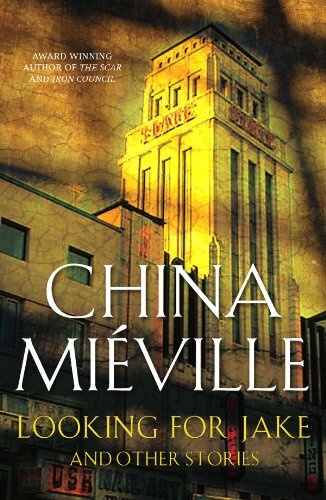 The novels and non-fiction writings of China Miéville have helped to redefine fantasy fiction for the new millennium. His gritty Bas-Lag novels ( Perdido Street Station , The Scar , and Iron Council ), which are propelled by an unabashed affection for left-wing politics and pulp-fiction monsters, have served as easily identifiable counterpoints to the old-fashioned storytelling of J.R.R. Tolkien and his hordes of acolytes. Miéville’s novels champion moral complexity and debunk good-versus-evil stereotypes, and at 500-plus pages they are littered with rich imaginings, showing little concern for narrative restraint—Miéville throws everything but the kitchen sink into these books. So when picking up Miéville’s new book, Looking for Jake —his first collection, comprising all of his shorter works from 1997 to the present—I was justifiably skeptical. How would he adapt his wildly imaginative brand of storytelling, so obviously suited to a broad canvas, to the constrictions of the short form? What first struck me about Looking for Jake is its slight stature. These 14 stories barely cross the 300-page mark, and that’s with some generous use of white space and the inclusion of a 15-page, sparely written graphic narrative (“On the Way to the Front,” illustrated by Liam Sharp, which I had difficulty following). Though Looking for Jake includes 4 previously unpublished short pieces, it would have been nice if Miéville had included a new novella or short novel to give the book some more bulk. But it’s not the length that counts, right? Wrong. For Miéville length, or more accurately space, is everything. Without the freedom that space provides to blend and juxtapose disparate ideas and styles, Miéville’s imagination is straitjacketed, and the stories in Looking for Jake feel, I daresay, a bit insignificant. That’s not to say the collection is unsuccessful, but merely that it never feels weighty or important the way his Bas-Lag novels do. Dark urban fantasy stories populate most of this book, as does Miéville’s typical mix of monsters and politics, making Looking for Jake a must-read for established Miéville readers. But unlike his novels, where pulp, politics, and humanity are blended into a seamless tapestry, here the pulp and politics too frequently eclipse strong characterization, eliminating the emotional resonance of the tales. Take a story like “Familiar,” which is a lushly written monster story about a witch’s insatiable familiar—fun to read, certainly, but it seems merely an exercise in grotesquerie without a greater purpose. In contrast “‘Tis the Season,” a near-future satire about capitalism run amok at Christmas time, feels too obvious, delineated with too little subtlety. Not to mention the political-paranoia-thrillers “Go Between” and “An End to Hunger.” Both offer few thrills and had me asking “so what?” “Go Between” will make you wonder if the narrator is psychologically unreliable or actually complicit in changing the world, and “An End to Hunger” will make you angry at the lukewarm efforts of contemporary liberals. But so what? But … Looking for Jake also contains some real gems of quiet, understated horror. The post-apocalyptic title story, “Looking for Jake,” recounts the end of civilization, which Miéville ushers in not with a bang but “with a long-drawn-out breath” (p16). Vaguely described “hungry flapping things” are the story’s monsters, but the real horror is in the story’s dense atmosphere, which, though the story was published in 1998, impeccably captures the surreal atmosphere of 9/11. I was also impressed by “Details,” which is about a young boy’s awakening to the world. The Cthulhu mythos exists literally just off the page. And I was most surprised by “The Ball Room” (co-written with Emma Bircham and Max Schaefer), not because it’s the collection’s best story, but because its style is so spare and its story so seemingly simple. A playroom in an Ikea-like store is haunted or possessed (take your pick) and in need of an exorcism. It works fine as a metaphor for the loneliness of childhood. “Foundation” and “Different Skies” also expertly utilize metaphor. The former is a deft blending of extraordinary imagery with political commentary, as a Gulf War veteran is haunted by his, and the rest of humanity’s, wartime atrocities. The latter focuses on a 71-year-old man’s fear of the younger generation, which is literally coming through his window from another world. Then there are the collection’s centerpieces—both “Reports of Certain Events in London” and “The Tain” are Locus Award recipients. “Reports” is little more than an exercise in meta-fiction (China Miéville is the narrator) about a supernatural traveling city and its denizens. The novella “The Tain,” meanwhile, is a military fantasy about a race of mysterious creatures, unknowingly captured by humans inside of mirrors, who have broken free and ravaged the world. Miéville instills this story, much like “Looking for Jake,” with a heavy atmosphere that is difficult to shake, while systematically subverting all of the conventions of military fiction, giving them a pacifist’s tint. The only flaw is the main character, Sholl, who is under-written and little more than Clint Eastwood’s Man With No Name. Finally, there is a Bas-Lag story, “Jack,” which recounts the last days of the Robin Hood-like Jack Half-a-Prayer (of Iron Council fame). It is an excellent piece of narration, though without any deeper human connections. Looking for Jake is an uneven collection, but one that provides some memorable atmospheric moments. Perdido Street Station it’s not, but for those of you whom life is nothing more than passing moments between new Miéville novels—enjoy!